I don’t think I’ve ever had a heavier heart about writing an article. I need to tell you at the outset that I don’t believe any stigma should be attached to mental illness, nor any shame. But the train of events, and the continuing actions of the person involved and of the people supporting her, make it impossible not to set out the facts as they now stand, as a counter-balance to what is likely to become even more malignant in the next couple of days. 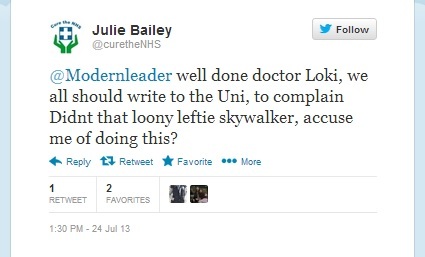 I wrote in May about an apparent attempt by a supporter of ‘Cure the NHS’, Julie Bailey’s campaign group, to blackmail the university of an opponent into silencing him. A character calling him/herself ‘Loki’ started commenting on that post, and then materialised on Twitter with the express intent of causing ‘mischief’. This ‘Loki’ eventually wrote a blog article admitting to being the person who had sent the threatening letter to the university – and to being a Cure supporter. At the same time, the student in question received a visit from newspaper reporters asking about his past – ‘Loki’, or someone working with him/her, had contacted The Sun with details, knowing that rag likes nothing better than something salacious. I am aware of Cure The NHS them and have sympathy for them so in that regard I am a supporter. I am aware of Cure The NHS and feel sorry for anyone who has lost a loved one but I could in no way considered to be a supporter. Clearly, ‘Loki’ felt a need to distance herself (it is a ‘she’) from Cure because of the spotlight shone on her activities – but, as we’ll see, even the claim to be merely ‘aware of’ Cure was already an attempt to mislead. I write with respect to an (sic) postgraduate under your supervision, xxxxx. I follow xxxxxxx on Twitter and have become sufficiently concerned about his behavior there to feel compelled to write to you. Some context. 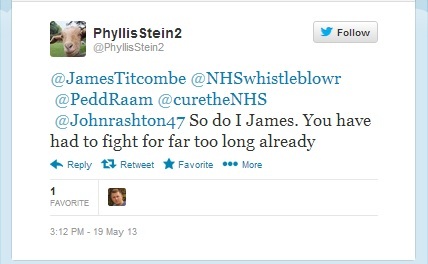 xxxxxxxx frequently gets into arguments with online NHScampaigners over a number of health related topics including (and amongstother things) hospital mortality statistics and the Liverpool Care Pathway. The 2nd blog article claims that its author’s motive in sending the email was a concern over the areas of study in which the student is engaged. But the email itself says that its sender has “no interest in damaging xxxxxx’s career” and makes clear that the action demanded of the university is to stop the student from tweeting. It’s unmistakably obvious that the reality of ‘Loki’s actions and motivations are far from what she would like us to believe. Munchausens is a mental disorder whose sufferers inflict harm on themselves because they crave the attention they receive from wellwishers who think they’re merely ill. The ‘by proxy‘ version is more insidious, in that sufferers inflict harm on someone else, usually a child in their care, for the attention and sympathy that they will receive for their child’s suffering – like the woman in the film, ‘Sixth Sense’ who had gradually poisoned her daughter to death so that she could feed on the sympathy as a ‘bereaved’ mother. In tweets on her account, Phyllis claims that these diagnoses and actions were unjustified, and blames doctors for her child’s condition. To paraphrase a famous saying, ‘she would, wouldn’t she’ – but even if her claims are true, it provides a massive motive for extreme behaviour toward anyone challenging the claims, by Cure and similar people, that ‘the NHS is killing people’. In no way a supporter? Hmmmm. And this support is a two-way street. Over the last few days, various Cure members and hangers-on have attempted to ‘mob’ me on Twitter – no doubt worried because some members of the mainstream media have begun to ask questions about some of the issues I’ve highlighted with Cure’s claims. So Phyllis’ protestations that she’s not a Cure supporter appear to hold no more water water than Cure’s and Ms Bailey’s previous attempts to disassociate themselves from the blackmail. Why am I writing an article I’d much prefer not to? I’ve had this information for a little while, but have ‘sat on it’ rather than share it unless I felt I had no alternative. That time has come for a couple of reasons. Firstly and most importantly, while The Sun evidently did not pursue the story beyond its initial contact with the student, it appears that ‘Phyllis’, or her Cure helpers, have taken the craven behaviour to new depths by prompting at least one, and probably more than one, newspaper to run with it. If things progress, these papers will run a story targeting someone for their past, even though their university is fully aware of their history – merely because Cure and its supporters do not like his views on Twitter about their claims and activities. That kind of cowardly, mob-driven behaviour can’t stand unchallenged, and the real sources of the information, and the reasons for abusing it, need to be exposed for what they are. By exposing it pre-emptively, I hope that fewer people will fooled into believing that the story was prompted by some ‘well-meaning’ person ‘for the public good’, and will instead see that these are the actions of a snide and hypocritical set of vigilante for their own motives, benefit and satisfaction. In a distant second place is the fact that some of Cure’s members and hangers-on have decided that this situation is a good opportunity to attack and attempt to discredit me – that there is a ‘taint by association’ that they can exploit. 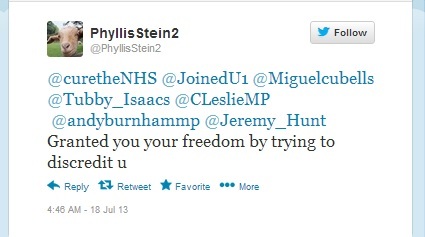 ‘Phyllis’, before her ‘Loki’ account was suspended, sent out dozens of messages to people who either follow my blog or have a high profile, in order to try to discredit me for defending the student’s right to voice opinions on NHS matters, and for describing her actions as ‘vile’, ‘cowardly’ and ‘beneath comtempt’. There are much worse tweets, too, but I’m not prepared to reproduce their poison here. Ironically, Phyllis complained that her accounts were being suspended by Twitter because I or others had ‘maliciously flagged’ her messages as spam. I’ll leave it to your own judgment what to make of that. But others – again Cure supporters – have taken up her cause with gusto. The lamentable ‘whistleblower’ Gary Walker is among them. I’ve had the privilege today of speaking at an NHS rally in Darlington. As well as tweeting links to Loki’s blog on his own account, Mr Walker attempted to persuade Clive Peedell, the founder of the NHA party, not to share a platform with me because of my supposed ‘involvement in a scandal’. Though, as the existence of this article makes plain, he was mistaken in his claim. Cure and its friends claim that they want nothing more than to improve and defend the NHS. Their actions already made that statement nonsense – but could anything demonstrate it more eloquently than Gary Walker’s tweet? He would prefer campaigners to withdraw from a rally to defend the NHS rather than share a platform with me. That speaks encyclopaedic volumes about his motivation and mindset. 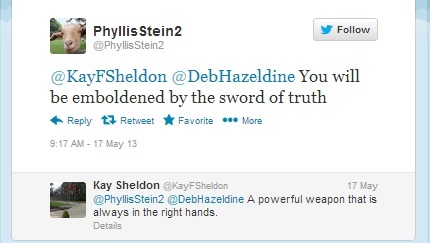 And the motivation of ‘Phyllis’? If her protestations of innocence of harming her children are correct, then she has an obvious axe to grind against the NHS that she feels betrayed her. If they are not, then we have a mentally ill person trying to deflect the guilt for her actions. Either way I feel sorry for her personally. But for her actions, I continue to feel nothing but the deepest contempt and horror. And I stand absolutely by my belief that a person’s past history in a completely unrelated area have no bearing on his entitlement to participate in the discussion about the assault on the NHS, nor on the validity of his reasoning about it. And Cure and co? That Bailey, Walker, Cubells and others feel entitled not only to spread poison about this man in order to silence him, but also to pat themselves on the back about it, speaks more than eloquently enough of their true motives, heart and mindset. ← The Coalition’s biggest hits, Volume 1. I’ve been watching this saga unfold, and it’s all very sad. I am concerned for the student involved; his past has no relevance to comments he might choose to make about the NHS. If his university are satisfied that he can study his chosen field, he really should be left to get on with it. It has nothing to do with anyone else. It seems to me that there are regular tweeters and supporters of CTNHS who are not entirely well – there is an undercurrent of resentment and bitterness which worries me. Grief can do very strange things to people; I can’t help wondering if come of those concerned could benefit from grief counselling or something. I’ve got quite mixed feelings about this. I feel a bit sorry for JB and others who are getting beyond obsessed with this, and I can see that they will be used by Hunt et al which will not help them to do what they claim they want to do; but I also feel that some of the tweets etc. are so personal and so vicious that someone really needs to have a word. I find it odd that the “charity” is soliciting donations but has yet to be registered with the Charities Commission; usually any income above £5,000 means it is no longer a “small” charity, so I’d be keen to know how much they have raised and whether it’s been declared to HMRC. This whole saga gets odder by the day. I’m appreciative of your efforts, Steve, and I hope you are not paying too high an emotional price for your sterling work. Great points! Thanks for your concern – I’m ok. Sad, and often frustrated – but determined that ‘nil desperandum’. The issues and the future of the NHS are too important. I think the whole company business is as a vehicle for “payment of fees” for appearances etc; and not as formal charity. I may be wrong and the previous in no way suggests wrongdoing, its just a better way to deal with non-standard payments that are not classed as “employment” and nicely tax efficient. The MSBP connection makes a lot of sense. The way that people who are obviously mentally ill or acutely distressed (again I do not wish to stigmatise those with MH problems) are manipulated or exploited by Cure is quite worrying. Well done on your sterling work from me too, I owe you big time Steve! I too have watched all this unfold with shock and horror, I don’t tweet but I do read and the attacks on people are uncalled for and vile to say the least. Anyone who dares to ask a question or as in my case in a group express concern that the grief process has not taken place has been met with anger and derision. I am now long past sympathy for these people who run at pace with vitriolic banter…………Cameron and Hunt must clap their grimy hands in glee every day that the people they are using as puppets are doing such a grand job one way or the other. Hi Steve. Yet again an excellent post that exposes the malicious drivers behind the ‘cure’ tribe. As you know I fully support your posts and often retweet and share via Facebook. This one,?however, is a difficult one for me. 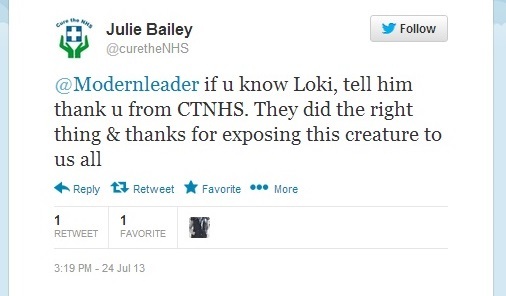 I am a registered mental nurse (RMN) and as such I have a difficulty re ‘Loki’ and the alleged diagnosis. Generally, such disorders fall I to the spectrum of mental health (but not mental illness in my humble opinion). Such an area is fraught with stigma and judgemental ism that I cannot forward this specific post. For those interested check out http://www.mentalhealth.com for info on disorders including DSM and ICD criteria. Keep up the fantastic work Steve and I will continue to re-post your posts. Tim. Thank you. I’ve tried to make sure to leave room for the fact that the diagnosis might be incorrect – but even if it is, it doesn’t change the underlying issues. I’m extremely uncomfortable having to raise the issue at all, but didn’t feel there was a more acceptable option. I completely understand your sensitivity about it. I have professional experience of these issues too (nursing) and I agree that it’s an area fraught with misunderstanding. But if we set that aside for a moment, the situation is that Steve and anyone who supports him are being attacked for daring to express a view – and I think things have gone beyond rational argument. Whether this is due to some mental problems or not, the people concerned really do need to take some responsibility for attacking an individual whose past/present is irrelevant to the subject. Looking into the backgrounds of some of the people involved, it seems to me that they have become so wound up they are no longer capable of listening to reason; they appear to believe that any dissent is a personal attack, and are responding in kind. I am actually concerned about this – not just for the people CTNHS followers are attacking, but for those followers themselves. At some point, they will have to realise that what they are doing is not helping the NHS and is playing directly into the hands of Hunt – who will drop them like a stone as soon as he’s got what he wants. I still feel that some of these folks have unresolved grief and guilt issues, and are using this campaign to feel better about themselves; many of the testimonies don’t make sense at all (eg. vases) and the whole campaign has become very shrill and very vicious. It’s a shame. And I feel sorry for them. But to target someone who happens to disagree with them and attempt to smear them in public by rehashing issues relating to a spent conviction is disgraceful, and whatever their problems are, they must take responsibility for it. I found and read the blog post of ‘Loki’ in which she reproduced the letter to the Uni about the student in question. I was frankly appalled and I think any right minded recipient of that letter would have been equally appalled. Like you, Steve, I have a sort of sympathy towards the mentally ill but that doesn’t extend to condoning the kind of anti social behaviour such illness often results in. The fact that Cure latched onto Loki’s mischief speaks volumes about their mindset. THEY don’t have the excuse of being mentally ill as she does and if this post does nothing else it does expose them as bigots and cranks. For that you should be congratulated. I wish I could say I was shocked at the reaction on Twitter from those involved and their supporters. It’s as if they’re so convinced their cause is right that anything they choose to do must be right too. Defending the indefensible and not even seeing it. They very much believe “the end justifies the means” – for them anyway, not anyone else. Absolutely disgusting behaviour from Cure and I have also been watching there vile tweets recently. Some one needs to take note and put the facts right because no one seems to be able to contradict them without receiving abuse. That’s right. I asked my housemate about this – who’s a nurse – and he said that flowers aren’t allowed because of potential lung conditions and irritation I think. But yeah, why was the DM allowed to print a blatant lie? Surely even their journalists have an obligation to do at least some basic research to ensure a story is true. Of course, if their plan is to just prime the NHS for privatisation then I guess they don’t mind that it’s a lie. Try asking Shaun Lintern about fact-checking on stories like that and you get a very evasive answer! Repeat a lie often enough, emphatically enough, and it becomes the truth – I believe this to be the basic principle behind much that is printed by the Mail, Telegraph and co.
One quote stands out to me here from that article – “it looked like the handwriting of a middle-aged woman”. What utter nonsense! If the officer did say that (which I doubt), then they are very foolish. How could anyone possibly say a particular sample of handwriting is from a middle aged woman? That was a poor attempt to smear someone whose name we all know. That Mail article is just typical of the sensationalist tripe they produce on a daily basis & I doubt that most of what Bailey claims is true. We never see evidence of the desecrated grave – it’s the first thing most photographers would point at & the first thing most media would use when introducing the story. Shock tactics are very effective & the lack of photographic evidence is telling. If the claims of being spat at in public are true there would be a queue of people willing to say they had seen it. Where are they ? Again, the lack of evidence is telling. As for her cafe – she put it up for sale on eBay for £15,000 so the reference to being a ‘paltry’ sum of £14k is just to cause readers to sympathise. Wasn’t the cafe leased rather than freehold ? If so, she was selling the lease, not the cafe hence the relatively cheap cost. Every utterance of Bailey is of the ‘poor me’ type & it’s all without proof. Sad to see. 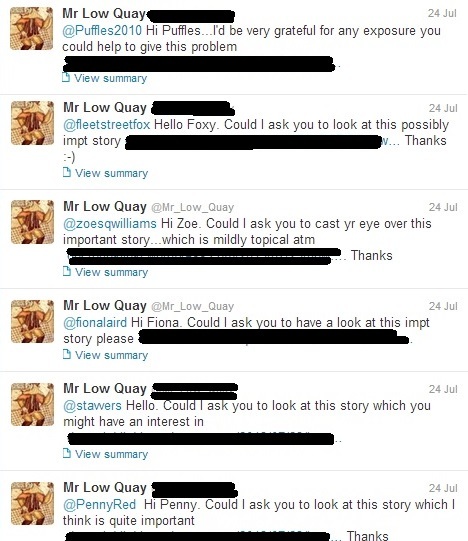 Steve – any chance you could investigate the claims that Cure is a charity ? I know she doesn’t need to register it as such until donations are £5000 pa but exactly where do these donations go & what are they used for are questions that need answering. AFAICS Cure are not producing anything that requires funding since all the groups are just self-appointed people kicking up a fuss. I’ve been working on it, but not enough information to draw any firm conclusions yet. Likely to change sooner rather than later! Female handwriting tends to be more rounded and the language used tends to be more emotive than male writing; due to lower education standards and greater keyboard use handwriting standards have dropped; Changes in handwriting teaching methods have changed the base the handwriting method used by people in different educational years and regions. I am not an expert but I can tell a middle aged woman’s handwriting from a middle aged man or a person in their 20s or less with a fair degree of accuracy.